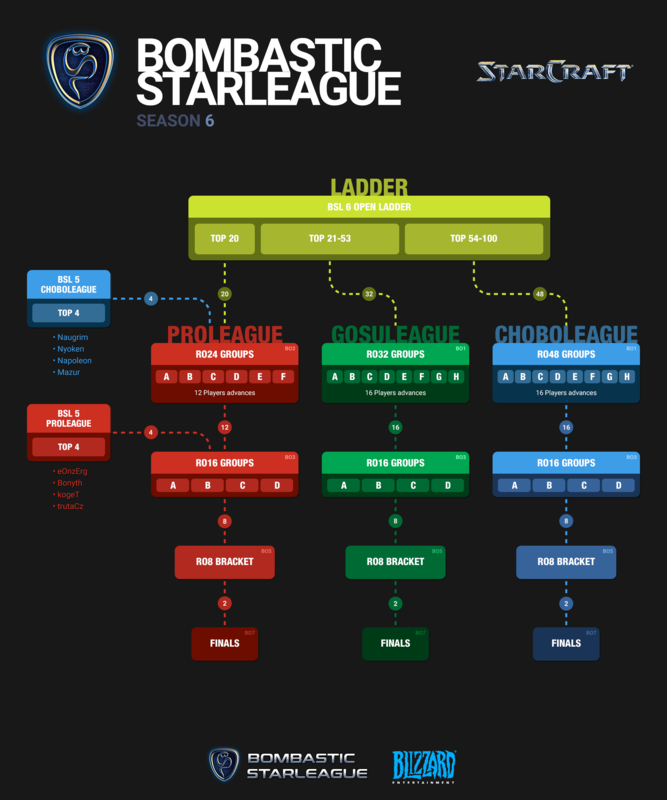 BSL Season 6 - Format, Maps, Schedule and More! 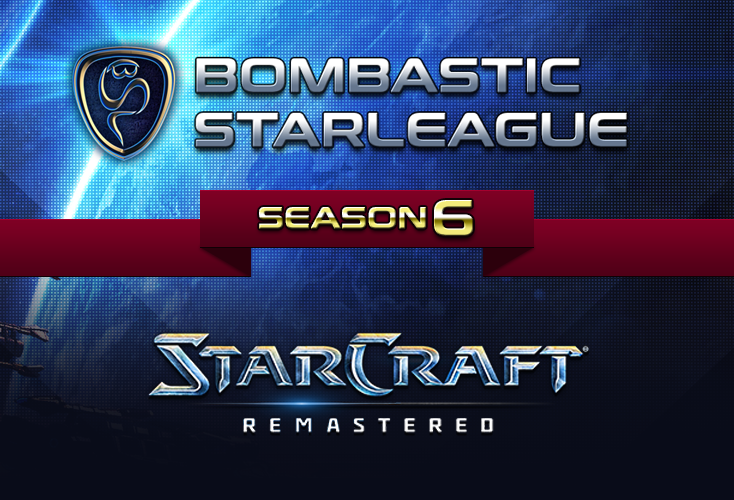 You can’t stop Bombastic StarLeague! We are happy to announce BSL Season 6 starting December 23, 2018. As we promised, BSL Season 6 starts immediately after Season 5, just to keep you guys warmed up. It’s possible thanks to Blizzard Entertainment, because they are officially sponsoring the prize pool of Season 6! Don’t forget to thank them when you have the opportunity. and many more great events! As you probably know, we are not only focusing on the very best players, but also aiming for top amateur players. We want to encourage new players to join the competition. That's why Season 6 will extend its format to 3 divisions: BSL ProLeague, BSL GosuLeague, and BSL ChoboLeague. Make your own account with the BSL6-Tag on any Gateway. For example: BSL6-Hatchet, BSL6-HaN, BSL6-ZZZero, BSL6-Dandy, etc..
Who will advance to the next stage? You should also continue playing BSL ladder after qualifying, as higher placement in the rankings will give you an advantage during map vetoes. Ro24 Group Stage – Six groups with four players each, double-elimination, best-of-three. Top 2 of each group advance to the Ro16. Ro16 Group Stage – Four groups with four players each, double-elimination, best-of-three. Top 2 of each group advance to the Ro8. Ro8 and onwards – Single-elimination bracket, best-of-five. Ro32 Group Stage – Eight groups with four players each, double-elimination, best-of-one. Top 2 of each group advance to the Ro16. Ro48 Group Stage – Eight groups with six players each, double-elimination, best-of-one. Top 2 of each group advance to the Ro16. Map pool to be announced [5 maps from ladder, 2 new ones, 2 old ones]. All matches during the group stages are Bo3. 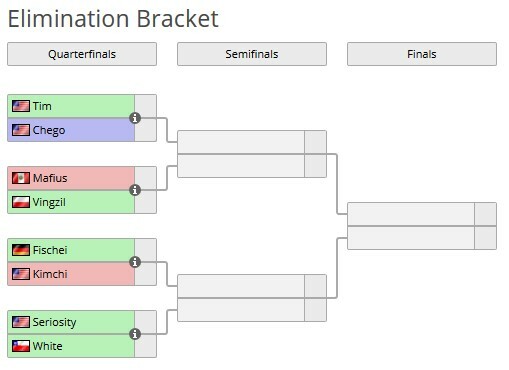 Ro8 matches and onwards are Bo5. Grand Finals are Bo7. As a map pool, we will use 9 maps. As there are 9 maps in the map pool, 6 maps need to be eliminated for a Bo3, 4 maps for Bo5 and 2 maps for Bo7. All vetoes and map picks need to be made before the matches. The player with the higher ladder stage ranking can decide if they want to veto first or second. The order for vetoes is ABABAB ABC for Bo3, ABAB ABABC for Bo5 and AB ABABABC for Bo7. Once all vetoes and map picks are done, you can start the matches! Players must be online and available on Battle.net channel Op BSL (Europe) 15 minutes before their scheduled match. Secondary channel of communication is BSL Open Discord server. 15 minutes after scheduled time, if one of the players not responding, his opponent may claim a technical win for one game. 15 minutes after that he can claim a win for the whole series. Every match prior to the Elimination Stage can be played ahead of schedule if both players agree. Contact your opponent and set up the date to play. We strongly suggest using BSL Open Discord for this so admins can keep track of things. On the selected day, play your match. Apply the same rules as for a regular match - use Op BSL and Discord to communicate. If both players were unable to play on their selected date/time or weren't able to set one up, match should be played as it was scheduled. It is not allowed to livestream your games or announce the result if you are playing your match earlier. Winner of the match must upload the replays. Default Turn Rate setting is DTR. If both players agree, Turn Rate setting can be changed. If one of the players gets disconnected from the game before the 2-minute mark, the game must be replayed. If one of the players had an advantage after the 2 minute mark, the decision is up to the admin. Everyone should allow ZZZero or another official caster to join the game for broadcast. If you have any questions, feel free to ask Hatchet, HaN or ZZZero. This is so great. Thanks Zero & the team consisting of so many great people, especially Hatchet and HaN. I also wanted to send big thanks to all the people that cheered for me in BSL5! I wasn't able to play up to my game and hope to really have some more practice for season 6. If anyone wants to arrange some regular practice games ping me! Was rooting for you! The games vs. Bonyth were so close, great performance overall. Gl in next season! Crazy turn around time. Looking forward to it. Thank you ZZZero! Loved watching the games earlier today. Thank you for all that you do for foreign Brood War!! Simply amazing. What you're doing for this community is inspiring, and I hope there are others to soon follow. I love and appreciate everyone who contributes to this from admin to player. Long live broodwar! Get this man more sandwiches. Awesome! Stoked this is gonna keep going! Long live BW! Gonna tryout for the fun of it! Gonna see if my E rank is good enough to get me to chobo league! Thanks, Zzzzero! Love your tournaments! BSL5 final was the first content I watched and I had immense amount of fun. Thank you for the efforts! I will follow BSL6 more closely, it should produce fun games. Sweet, thanks for all of your help hosting events in the community, you guys are awesome and this is great news that Blizzard is now sponsoring Season 6 of BSL. I think you should make that fact stand out a little more in the OP text, that is pretty significant! Thanks for all nice words guys, that's so nice and gives us motivation to keep working. REMINDER: You should play at least 1 game to be displayed on our webpage ranking.